Highlands, NJ - The Navesink Twin Lights is a non-operational lighthouse and museum located in Highlands, New Jersey, United States, overlooking Sandy Hook Bay, the entrance to the New York Harbor and the Atlantic Ocean. 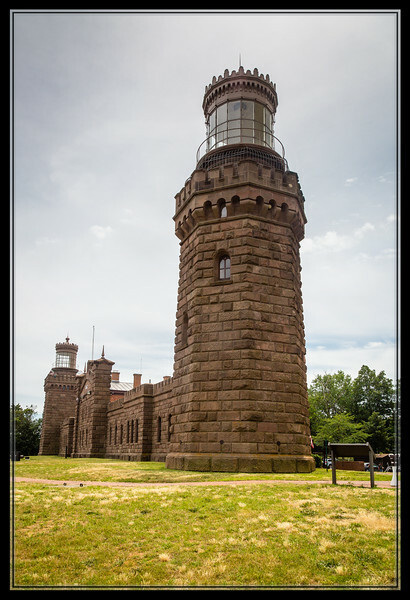 The Twin Lights, as the name implies, are a pair of beacons located 246 feet (75 m) above sea level on the headlands of the Navesink Highlands. In 1962, the State of New Jersey acquired Twin Lights. At the current museum facility, tours of the lighthouse, a climb of the North Tower and its expansive ocean view, and a view of the lighthouse equipment, await visitors. Twin Lights is listed on the State and National Register of Historic Places. A lighthouse existed on the site since 1828, when it became an important guide and landmark for ships navigating the treacherous entrances to New York Harbor. The current lighthouse was constructed in 1862. The non-identical towers by day and the two beacons by night—one flashing and one fixed—allowed ready identification by mariners of the identity of the facility, thus allowing a rough determination of their location approaching the harbor. This was the first American lighthouse to test a Fresnel lens and was also the site of a demonstration by Marconi of the wireless telegraph in 1899. A bi-valve Fresnel lens is on display in the museum. The north tower light was discontinued in 1898; at the same time the south tower was electrified, one of the first lighthouses in the United States to do so. It was automated in 1949, but was discontinued in 1952 as the importance of the light diminished. In 1962, the site was turned over to the state of New Jersey, by the Borough of Highlands. The sixth order lens was previously acquired and installed in the north tower by the Shrewsbury Power Squadron and presented to the town which reactivated the north tower as a private aid to navigation. This light remains active. I think this is one of the coolest lighthouses ever! Love the stone construction. Very stoutly built lighthouse ! Fine composition !! This is so wonderful and different. It looks like it should be in Europe somewhere. Great shot a info.